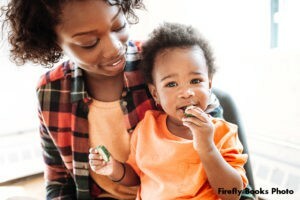 Baby-Led Weaning: The (Not-So) Revolutionary Way to Start Solids and Make a Happy Eater is an excellent resource for both new and seasoned parents. It’s filled with everything parents could want to know to get their child started with solid foods. The book covers everything from signs of readiness and first foods, to safe feeding practices, to special diets and allergies. It has great information on setting the stage for lifelong, healthy eating habits and even includes some great recipes. It covers what parents can expect and what to do if problems, like constipation, arise. 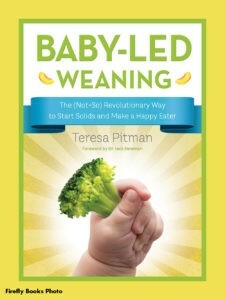 Teresa Pitman does a good job of sharing fact-based information in an easy to understand, engaging way that will help parents ‘Raise a happy, healthy eater the baby-led way!’ Teresa recently talked about her book with New Beginnings. Tell us a little about yourself and your family. I am the mother of four children and the grandmother of 10! I have a degree in magazine journalism and have written many magazine articles, as well as authoring or co-authoring 18 published books (including two for La Leche League International). How did you get involved with breastfeeding and La Leche League? When my first baby was born, the hospital nurses taught us to breastfeed side-lying in bed, but not sitting up. (I know, it was a strange time in the history of breastfeeding!) When I got home, I realized that this was going to be very awkward—I didn’t want to have to lie down every time my baby was hungry! But all my friends had either not breastfed at all, or quit shortly after they came home. Finally, I heard about LLL and gave the Leader a call. There was a meeting that week so I went. When I walked in the door, the first person I saw was a mother nursing toddler twins. I was rather taken aback—I had no idea you could breastfeed twins, let alone twins who were walking and talking. But the Leader helped me figure out how to breastfeed sitting up and I found I really enjoyed the meeting. I’ve been part of LLL ever since and was the Executive Director of La Leche League Canada for three years, as well as serving on the LLLCanada Board. Why did you decide to write Baby-Led Weaning? 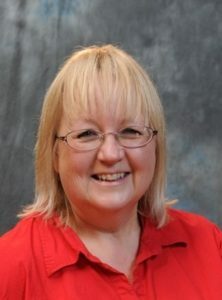 I loved the original book (by Gill Rapley) and had interviewed Gill for an article years ago. I thought there was a need for a new book for a couple of reasons. One, I wanted a book that would use language and settings more familiar to North American parents. Two, we now have a lot more research available on this topic that hadn’t been done when the earlier books were written. For example, we now have research to show that babies don’t choke any more often on foods they pick up and feed themselves than on purees that we spoon into their mouths. I thought knowing about that would be helpful for parents who might get some criticism from grandparents or others not familiar with these ideas. And three, I wanted to address some of the questions I hear from parents: about allergies, special diets, premature babies, etc. That information can be hard to find. What was your favorite part of writing this book? We decided to make the first chapter of the book the story of my granddaughter Isla’s introduction to solid foods. It was fun to share her story, and she’s so delighted to be in a book! I reached out to parents I knew through LLL and the Canadian Baby-Led Weaning group on Facebook to ask for photos, and we got lots of wonderful pictures of babies enjoying trying out food. Just looking at those pictures made me smile. I think another part I really liked was writing about the history of solid foods. You know, if you go down the baby-food aisle in a grocery store and see all the packages of cereal and little jars of food and pouches, you tend to assume all this is necessary. But in reality, the idea of special foods for babies is very recent. Understanding the history helps us find our way back to a more biologically appropriate approach to feeding. Writing and testing the recipes was also fun for me because I did it in conjunction with my daughter, Lisa, who is a published cookbook author. Can you share a favorite “baby-led weaning” story from your own family? 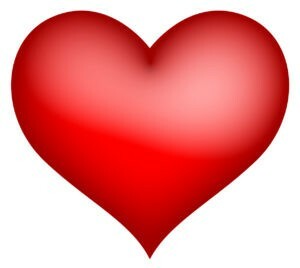 At the time my oldest son was born, new parents stayed in the hospital for five days after giving birth. (It’s so different now!) The other mother sharing my room was told by her doctor to give her baby cereal and orange juice on day five! So she started solids at five days. Most parents I knew started solids by the time their babies were six weeks old, as instructed by their doctors. But I’d been to LLL, and seen the research showing that waiting until the middle of the first year was better. Despite dire warnings from my friends, I decided to wait. But my baby Matthew was an early crawler, and at five months he crawled over to the dogs’ food bowls and scooped up and ate several mouthfuls of their food. I was in a panic and took him to the doctor immediately. My doctor just laughed and said that the dog food probably was more nutritious than most baby food cereals. “But,” she added, “I think this is a sign that he’s ready for solid foods.” He made it clear from the start that he wasn’t going to have food spooned into his mouth, so I just put things on the high chair tray and let him eat. After Matthew started food early, my next baby ended up being very late at starting solids. She’d just close her little mouth up tight whenever I offered her something. Both have grown up to be healthy, intelligent adults—just very different! Why is baby-led weaning (BLW) important? I think that story I shared above is a great example of why it is important. We now have quite a bit of research that suggests baby-led weaning can reduce the risk of a baby becoming overweight or obese. Childhood obesity is a serious problem in North America and other countries, so that matters. BLW encourages babies to listen to their own bodies and choose the type and amount of food their bodies need. Most adults who are spooning food into a baby from a jar will tend to try to encourage the baby to finish the jar – just like most adults tend to encourage babies to finish the bottle if they are bottle-feeding. This leads to toddlers and older children who are likely to “clean their plates” at mealtimes. With BLW, baby eats what he wants and stops when he’s done. For breastfeeding babies, this is a natural continuation of the way baby feeds at the breast. For bottle-feeding parents, this is an opportunity to let their babies develop the skill of listening to their bodies in ways they may not have done when feeding from a bottle. It’s a very respectful way to feed a baby and helps teach them to listen to their own body to know what they need to eat and how much they need. If you could tell new parents one thing about Baby-Led Weaning what would it be? Let your baby guide you. Let her show you when she’s ready to start solids, and let her show you how much food she wants to eat. Your baby’s appetite will go through ups and downs, but that’s normal and okay. We are excited to give away 5 copies of Baby-Led Weaning: The (Not-So) Revolutionary Way to Start Solids and Make a Happy Eater Enter HERE for your chance to win one of the five copies.